So you guys know I LOVE nail polishes right? Well, I love makeup in general as well too! I just love experimenting and trying new colours – more so now than before – as I have learned A LOT about makeup techniques thanks to the beauty community on Youtube, – thus, I possess the confidence now that I did not have before. With all this said – I am starting to blog about makeup as well. To start I have swatches from my MAC Fashion Sets & Lipstick Haul – which you can view that video HERE! 1. Impassioned Lipglass – is a bright coral pink with a high glossy finish. Moderately pigmented, has the trademark vanilla neutral scent of all MAC lipsticks and lipglasses. Perfect for a subdue but bright lip for Spring & Summer. 2. Impassioned Lipstick – is brighter coral pink with an Amplified Creme finish making this lipstick very smooth and buttery – I really love the Amplified finishes from MAC! Very pigmented and applied like a dream – definitely on a the bold side if you wanted a bright lipstick but it screams confidence! When paired together with the lipglass it makes for the perfect summer night out lipstick! 3. Girl About Town Lipglass – is a fuchsia based pink and is by far my favourite MAC Lipglass in my collection to date – it has the consistence of a liquid-lipstick!! Super pigmented with slight golden shimmer, I think this one is universally flattering on all skin tones and has a pigmented glossy finish. 4. Girl About Town Lipstick – is a fuchsia based pink with an Amplified Creme finish – it is pigmented, bright and A LOT of fun! While I love reds – I really like the idea of a very modern pin-up look using fuchsia lips instead of retro-red lips – something about it just screams KISS ME! I love it! 5. Russian Red lipstick – is a blue based classic red and is a Matte finish. This one sits on the fence even though it leans more on the blue toned red side – it looks very flattering on warm skin tones as well!!! So if you are unsure as to which red lipstick to start with at MAC I will definitely recommend this one! Because it is a Matte Finish – you will need to add a glossy top coat to achieve a fuller effect but I personally like the Matte look as it is more of a throw back to the 1940’s and 1950’s. 6. Vegas Volt lipstick – is a peachy coral with a very slight tone of a warm pink undertone and is an Amplified Creme. I really love this one – as with all Amplified Cremes, this one is super pigments and really glides effortlessly on the lips. I am SUPER happy I picked this one up as it is the PERFECT summer lipstick that can work for both day and night. This one also brightens up my complexion – so if you are my skin tone – this is a great lipstick for the warmer weather! 7. Craving lipstick – is a mauve with slight plum undertones and is an Amplified Creme. This one I choose as my Go-To lipstick in the Fall Season and I am very surprised at how much I love it already! It is pigmented, creamy, easy to work with and lasts quite a while on my lips as well. I saw this colour was recommended on a lot of women of colour blogs and I am very happy I picked it up! 8. Lady Danger lipstick – an orange based red and is a Matte finish. Where have you been all my life???!!! This is my FAVOURITE red lipstick of ALL TIME! Every lady has one in their collection, I never did – UNTIL NOW!! I really love it a lot and this one will be a repurchase for sure!!! It is pigmented, easy to work with and lasts a really long time on the lips!! Even though it is a Matte finish, I did NOT find this lipstick to be drying at all. But as with all Matte lipsticks of any brand, you must exfoliate your lips before wearing it because it will show all the cracks on your lips. 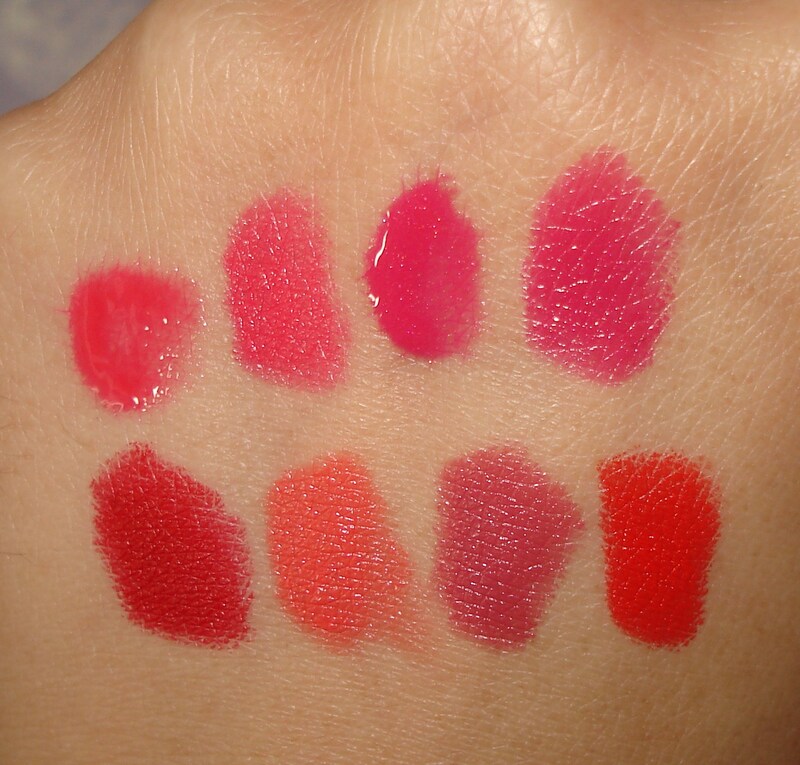 Do you own MAC Lipglasses and Lipsticks? What are your thoughts on these products?